Richard Irving Dodge was a military man who spent his term serving in the American West. According to the introduction of his book Our Wild Indians, he felt compelled to share what he knew about Native American culture from the thirty three years he spent on the Western Frontier. What caught my eye about this particular account was a chapter I found to be completely devoted to music. Transcription of a Song Irving Encountered. Transribed by Mr. Aschmann, leader of the band of the 23rd Infantry. The excerpt on the left demonstrates the level of detail used to describe instruments thoruhgout the chapter. The author spends nearly two entire pages of the chapter on the significance of words in Native American Song alone. Irving offers complex understandings of the intricacies of Native American music, recognizing the inability of the “uninstructed” ear to hear completely the changes in a song. 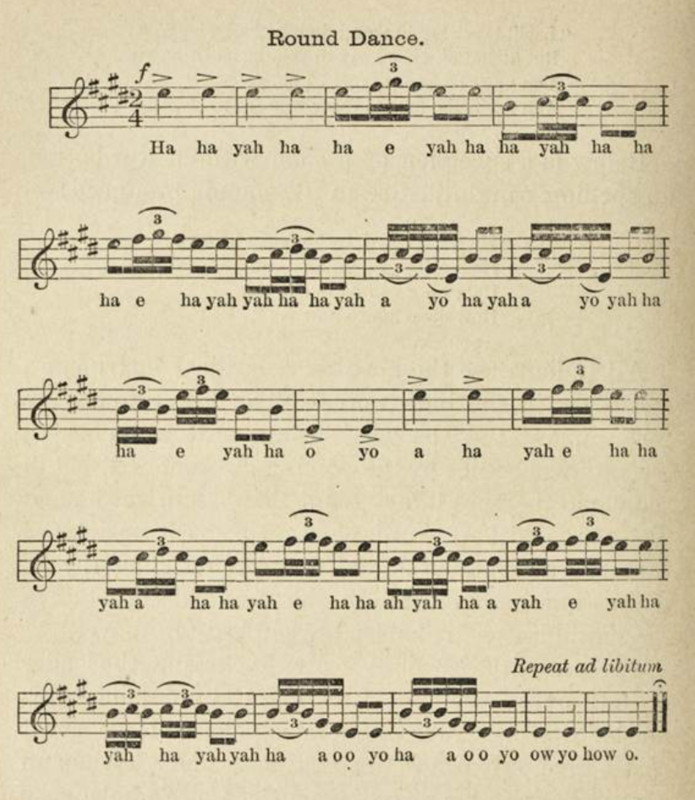 The chapter finishes with transcriptions of several songs Irving encountered. Compared to other primary source accounts of meetings with Native Americans, like those collected by Judith Tick in her work Music in the USA: A Documentary Companion, this chapter provides a far more complete look at music as a part of Native American Culture. But, as the saying goes, the road to hell is paved with good intentions. 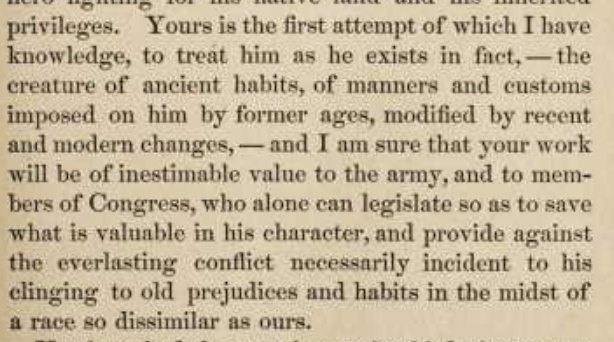 The fact that this book (at least in the eyes of Sherman) could be used to decide what is “valuable” to keep from Native American cultures is shocking to modern readers. Even the title, Thirty Three Years among Our Wild Indians, is (as the kids say) cringeworthy. 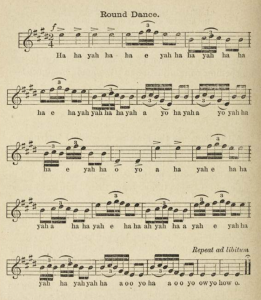 In the chapter about music, specifically, Irving refers to Native drums as “primitive”, and, of course, attempts to transcribe in Western notation songs that were never conceived with Western methods. Primary source authors are steeped in layers of deep cultural socialization. 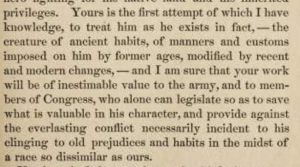 Irving’s best intentions to represent an accurate picture of Native life were foiled by his inability to separate his own cultural prejudice from his observations. Even though he wrote an entire book detailing the culures of different Native American Tribes, the book still advocates for picking and choosing which part of the culturewas suitable for adoption into American society. However, this racism doesn’t become abundantly clear until one examines the introduction and conclusion to the book. Often times, I find it easy to focus just on the musical structures in play while performing historical musicological reserach. This work serves as a reminder: everything (even music) must be taken in context. The descriptions of instruments offered in the full chapter are still valuable, but responsible scholarship demands that we all take a closer look before beginning to pave our own research with good intentions. 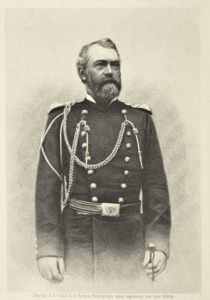 This entry was posted in Siriana Lundgren and tagged Native American Music, Native American Music Transcription, Primary Source, Transcription, William Tecumseh Sherman by Siriana. Bookmark the permalink. Fabulous work, Siri. If anyone else had been doing the “round-up” your post surely would have been included among the exemplary ones: hyperlinks, media, music (!! ), tags, references to course materials, insightful analysis and criticism, this has it all. I also learned a new word: “escutcheon.” That will come in handy, for sure. I have no negative feedback to offer. Sorry! Keep up the good work!! !